We have fabulous next-door neighbors, Jan & Don. They are essentially a third set of grandparents to my son. They moved out last weekend, moving into a single-story house. Jan is the most doggiest of dog-people I have ever met. When my friend Snow gave me a bag of her novelty fabrics that had a large stack of leftover dog fabrics, I knew those dog fabrics needed to go into a quilt for Jan. Finding out that they were moving just pushed up my timeline a little. 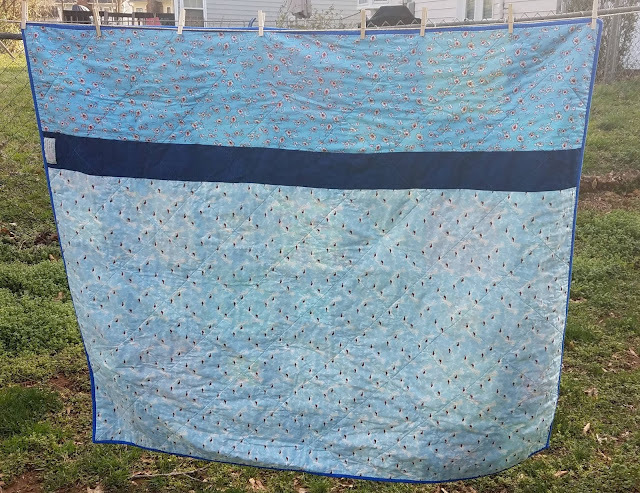 The pattern is Simple Layer Cake Pattern from Southern Quilter. I've made it once before, in monkey fabrics for my husband at Christmas 2013, though that quilt predates the blog. The background fabric is Kona Blueprint. I used stash to piece a back. Jan loves birds, so the main print I used was this great bird in trees fabric that I bought a few years ago. I feel a little bad about the fact that all the fabrics were essentially chosen with Jan in mind while I am equally fond of her husband Don. But, to be fair, no one gave me a stack of golfing fabrics. They spent most of last Friday moving furniture and I gave it to Jan Friday night. Don wasn't with her, but Jan texted me the next morning and said that they used it while sleeping on the couch the first night at their new house. Music to a quilter's ears, of course! Completing this quilt was my February OMG (one monthly goal) in the motivational link up hosted by Patty of Elm Street Quilts. This was also on my list of UFOs for UFO busing with Tish and a needed finish as I work toward my PhD (projects half-done) with Quilting Gail. Several years ago, my mom sent me a few novelty prints; I believe they came from a yard sale. This monopoly print was one of them. I've been wanting to use it for a while. 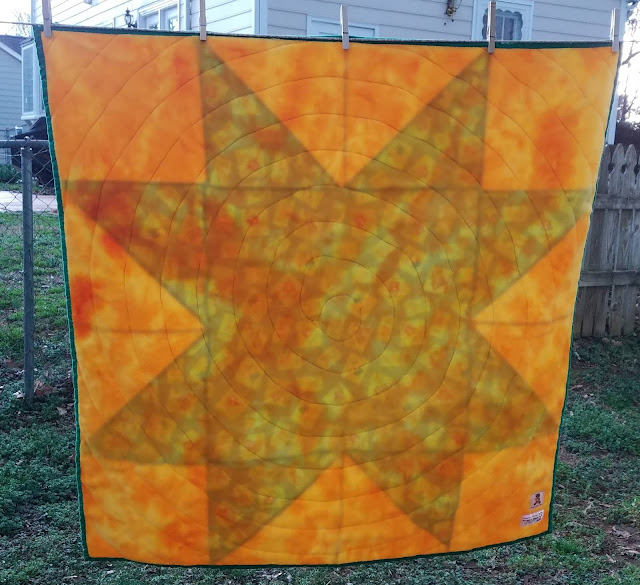 Some time last year, one of my Project Linus friends was making a large star quilt inspired by this Jenny Baker tutorial. 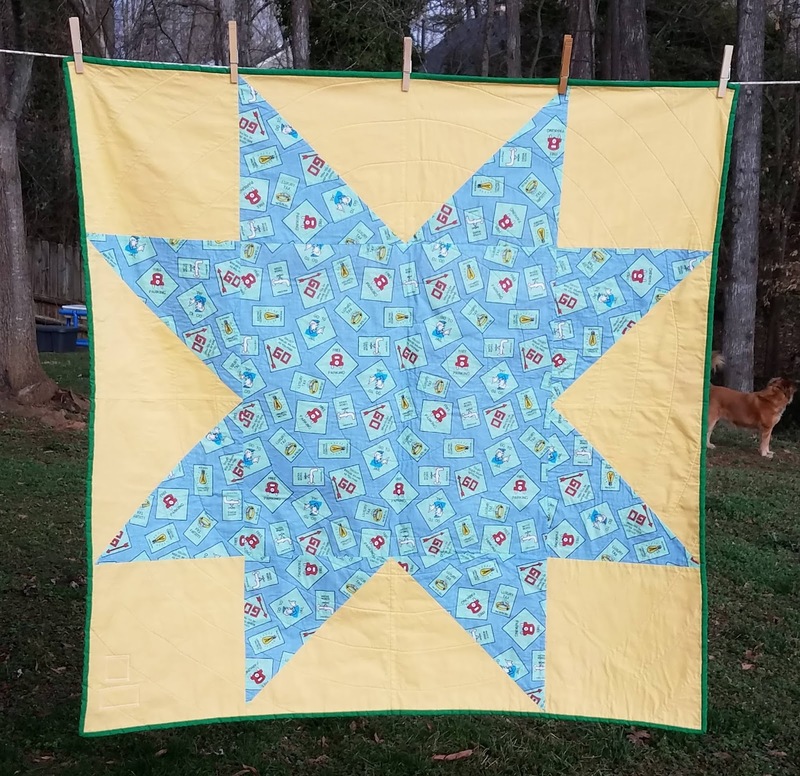 I thought the big star would work well with the Monopoly fabric. I didn't use Jenny's tutorial since mine is all one fabric; I figured out how big I could cut the pieces based on how much yardage I had. The background and binding are some solids I had lying around. I quilted it with a large spiral--same quilting pattern the friend used for the quilt that inspired this one. You can see that the spiral is wobbly at the start. It's backed with yellow mottled fleece. You can see the star on the front because of the light outside; it's not normally that transparent. 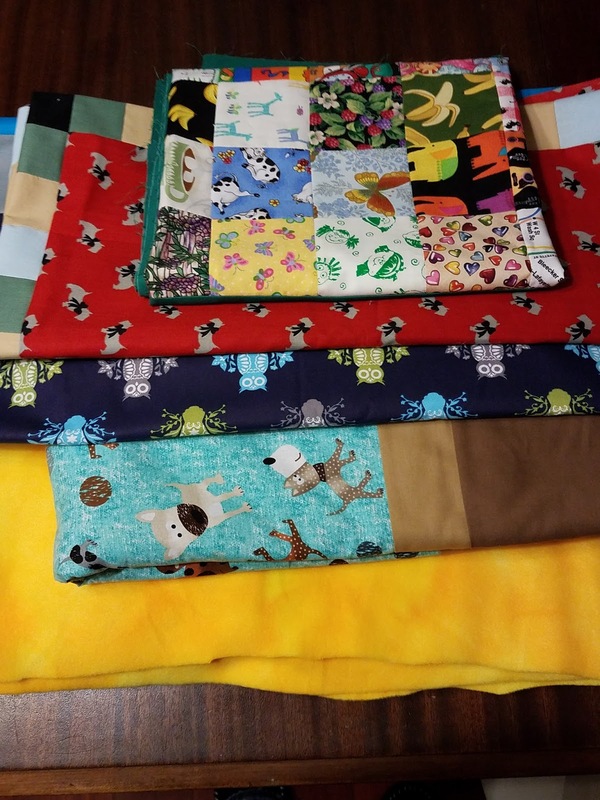 A quick funny story: I did the quilting at January's Project Linus meeting. One of our members frequently has her granddaughter with her, she's 9 or so. She is a lot of fun and really likes novelty fabrics, so of course she & I get along really well. 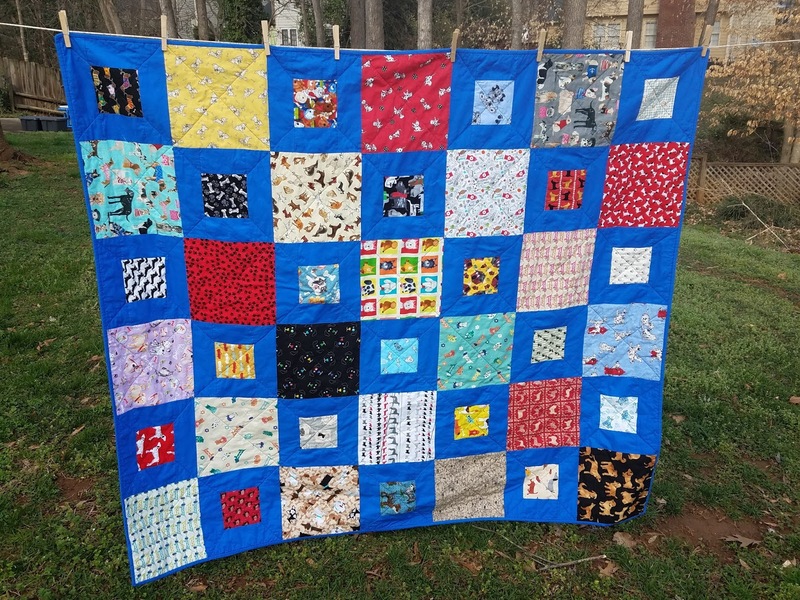 When she saw the fabric in this quilt, she exclaimed; "Is that MONOPOLY fabric?! Where do you find all these fabrics?!!" 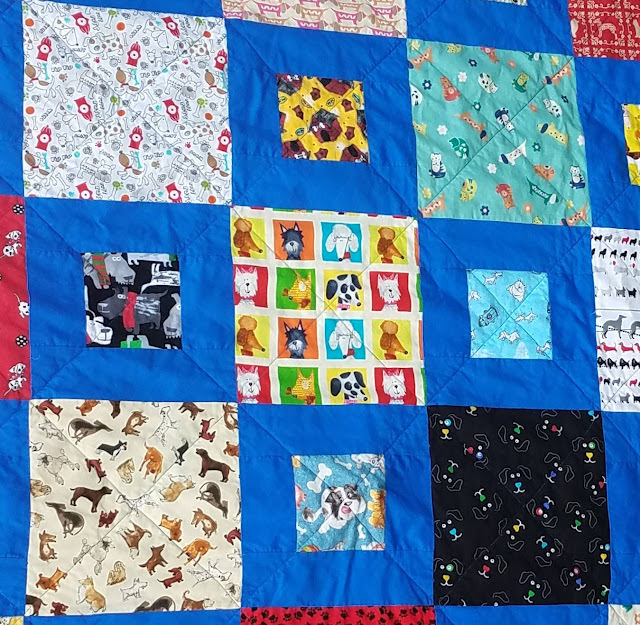 I love her exuberance and hope the recipient of this Project Linus quilt reacts similarly. This was project #17 on my list of Q1 goals for the globally-hosted Finish Along. Last year I made a heart mini quilt to hang on the front door. That's about the extent of my decorating so I did not plan to make anything Valentine related this year. 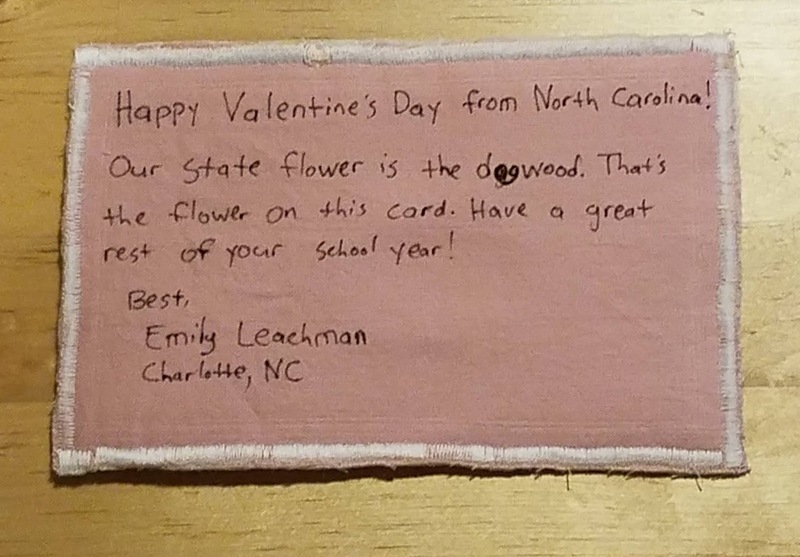 A college friend of mine and his wife posted on Facebook that their daughter's kindergarten class was hoping to get Valentines from as many states as possible. I immediately offered up representation from North Carolina. I didn't like my Valentine's Day card choices at the store, though, as they all seemed to be for a person in the singular. 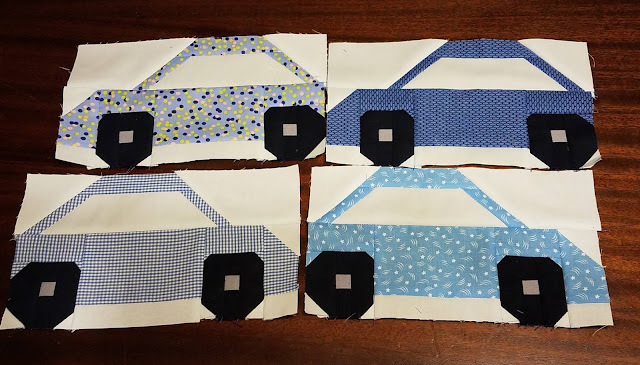 So when I saw Patty's tutorial for fabric postcards at Elm Street Quilts, I knew that was the way to go. 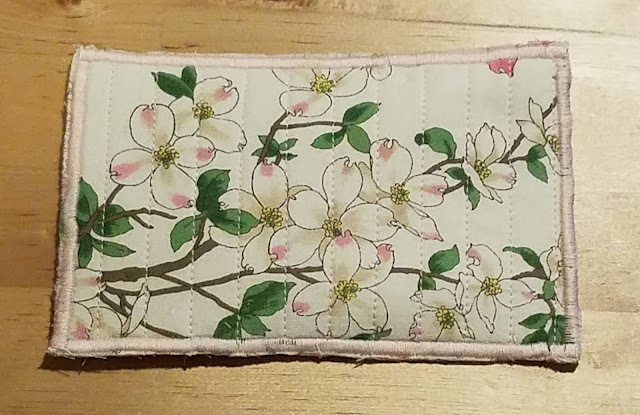 I had limited time if I wanted it to arrive on time, so I used a single piece of fabric on the front: no piecing and no applique. Dogwoods! 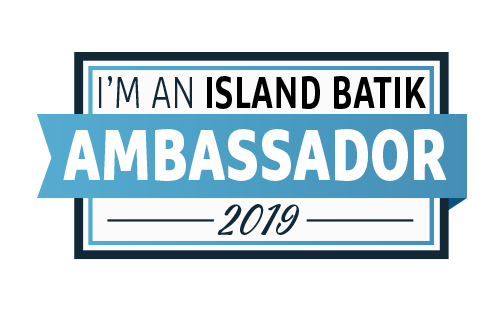 Not only personally significant, potentially educational! I figured using the state flower made it pretty and was a reasonable thing to mention to a class of kindergartners. Hopefully it's readable; I made a bit of a mistake on "dogwood" and micron pen doesn't edit easily. The fabric postcard was pretty quick and I enjoyed it! It's 4" x 6" and I did mail it in an envelope as I thought it would be safer. I can see more fabric postcards in my future! For 2018's Rainbow Scrap Challenge I chose two different patterns. 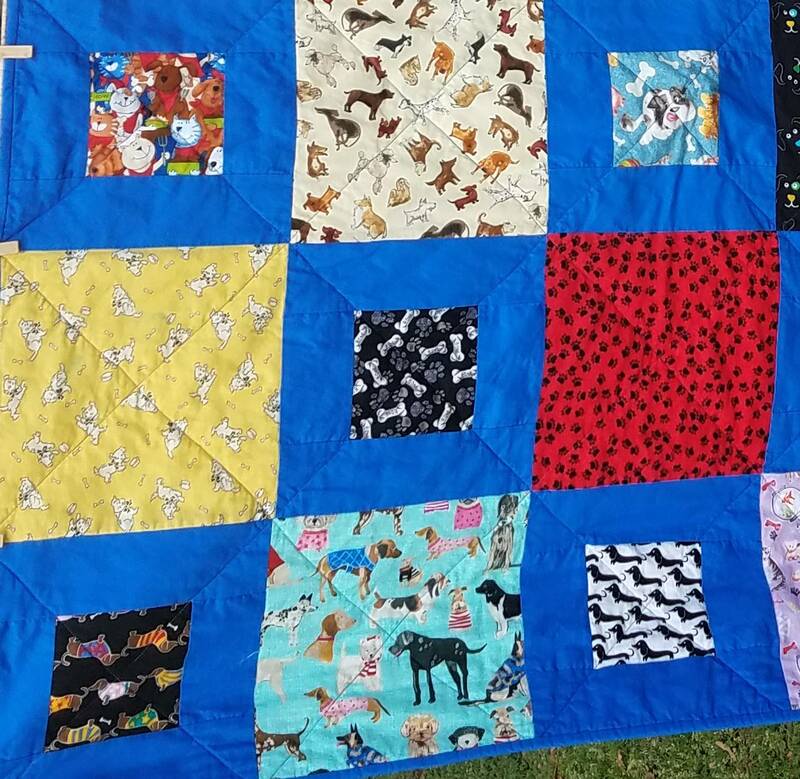 Both are by Lorna of Sew Fresh Quilts. I am making both Bumper 2 Bumper and Smitten Kitten. I now have 4 car blocks ready for Bumper 2 Bumper. These are January's blocks when the color was light/medium blue. I had some trouble with the tires because I cut the pieces to the wrong size. Now that I've caught the mistake, I should have an easier time with future blocks. I'm still working on the Smitten Kitten blocks from January. Hopefully I'll get caught up soon. I hate that I'm behind so early in the year. 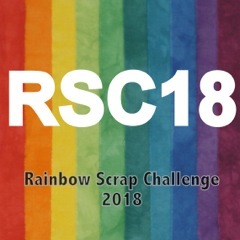 But the great thing about Rainbow Scrap Challenge is that are no real deadlines!